The 2005 NAEP results on ELL academic performance are available at the state level for 39 states in math and 34 states in reading. The same broad findings on the size and persistence of the achievement gap reported above for the national data are evident in these states to varying degrees. Regardless of grade or subject, ELL students trail far behind their white counterparts in the state in the proportion of students that perform at or above the basic achievement level. All available states had double digit gaps between white and ELL students and the gap often exceeded 50 percentage points (see the Appendix). Table 3 reports the NAEP achievement gaps between white and ELL students for the ten states with the largest ELL populations. 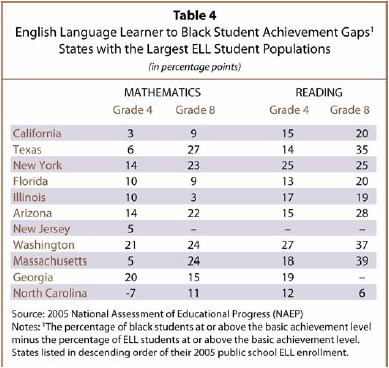 In many states for which NAEP results are available, ELL students trail behind black students in academic achievement (Table 4). In 2005 that was particularly apparent in reading. For example, in Texas in 2005, 49% of black fourth graders performed at or above the basic level in reading. Among ELL fourth graders, 35% performed at or above basic in reading, yielding a 14 percentage point gap between ELL and black fourth graders in reading. Examining the size of the gap between ELL students and white students, the achievement gap widens in most states between grade 4 and grade 8. Particularly in math, eighth grade ELL students are further behind their white counterparts than fourth grade ELL students. As with the national data, evidence from the states suggests that the decline in ELL performance from elementary school to middle school likely reflects change in the ELL population across grades. Administrative counts at the state level make clear that the ELL population decreases in size at higher grades. For example the state of California has detailed counts on ELL students over time. 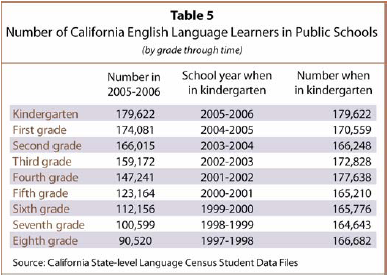 The second column of Table 5 reports the number of ELL students in each grade in school year 2005-06 in California public schools. Using prior school year data, the fourth column reports the number of ELL students when that grade was in kindergarten. In California the number of ELL students rises from kindergarten to first grade. After the second grade the number of ELL students decreases and it continues to decrease each grade thereafter. Similar patterns of ELL counts by grade were apparent in the states of Florida, Illinois, and Arizona (see the Appendix). The ELL student population is smaller in middle school than in early elementary school. Students learning English most rapidly were the students who departed the ELL population. It seems plausible that these students were the highest achieving ELL students. Their performance is not reflected in the middle school ELL results, widening the measured gap between white and ELL students. 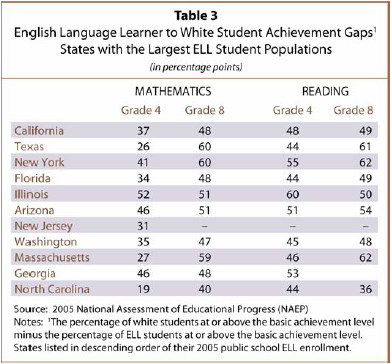 However, on the basis of each states’ reading and mathematics assessment, it is possible to compare how ELL students performed in that state compared to white students in that state. In each state, the percentage of ELL students that “meets or exceeds the state standard” can be compared to the percentage of white students that meet or exceed the state standard and the gap in performance can be measured. Using the most recent year available for the state assessment results, the gap between white and ELL test-takers was tabulated in the percent of students meeting or exceeding the state standard (see the Appendix for the measured gaps). The ELL-to-white performance gaps based on the state assessments largely mirror the gaps based on state NAEP. In both math and reading, and regardless of grade, ELL students trail their white counterparts in the percent of students meeting or exceeding the state standard. The state-based gaps were typically in the double digits and tend to widen as the grade level progresses. In states that have available results for their fourth and eighth grade assessments and also that participated in NAEP, the state-based assessment gap can be compared with the gap based on NAEP. The states that demonstrate the largest gaps between white and ELL students on the basis of NAEP also demonstrate the largest gaps in their state assessments. For example, in the 2005 NAEP in Arizona, 86% of white test-takers were at or above the basic level of achievement compared with 40% of ELL test-takers in grade 4 math. That produced a NAEP-based gap of 46 points (Table 3). Results of Arizona’s Instrument to Measure Standards (AIMS) in 2006 indicated that 85% of white fourth graders “meets or exceeds the standard” in math, compared to 42% of ELL fourth graders, resulting in a 43 point AIMS based gap between white and ELL fourth graders in math in Arizona. States with larger NAEP-based gaps also show larger gaps based on their own state assessment (Appendix figures A1-A4).